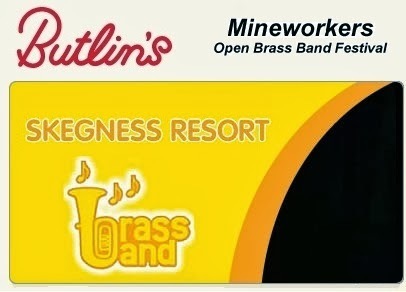 The Butlin’s Mineworkers National Open Brass Band Festival 2014 (incorporating The Butlin’s Youth Band Festival) is set to deliver its most spectacular weekend of competition and entertainment to date. The challenging test-pieces and huge prize fund, which includes a £10 000 first prize in the Championship Section, have attracted another bumper crop of entries for the Festival at the holiday Company’s Skegness Resort over the weekend 17 - 20 January. Saturday (18th) will see all five sections will compete on the following test-pieces; Championship Section - Robert Simpson’s Energy; Section 1 - Paul Lovatt-Cooper’s Vitae Aeternum; Section 2 – Kenilworth; Section 3 - Philip Sparke’s Music for a Festival; and Section 4 - Goff Richards’s colourful Three Saints. The Championship Section Entertainment Contest, hosted by the BBC’s Frank Renton, will take place as usual on the Sunday (19th). Guests will be able to enjoy the new multi million pound Waterworld and Spa, in addition to all the entertainment and facilities for which Butlin’s has earned an international reputation. The year’s Festival features live performances from a glittering array of artists and bands including, on the Friday night, the defending Champion Virtuosi GUS, the defending Youth Champion, Youth Brass 2000 with special guest, Chris Dean) and Horndog Brass Band. Horndog will play original compositions augmented by a selection of ‘brassed-up’ cover versions ranging from Aerosmith to the Grange Hill theme tune and traditional funk with a New Orleans twist that pays tribute to the band’s key influences, which include Dirty Dozen, Rebirth and Youngblood brass bands, Galactic, Lou Donaldson and Herbie Hancock. Brett Baker’s University of Salford Graduation Band will take to the stage in Reds auditorium on Saturday night for what promises to be a hugely entertaining programme followed by the Parpenrifters Bavarian Band performing a late night eclectic mix of traditional Bavarian music and modern day pop music, all with an intriguing traditional slant. Audience participation is key to the show and there will be games galore to keep the crowd on its toes - the losers taking forfeits have and prizes offered to the winners of the games! Meanwhile, the Syd Lawrence Orchestra will present its brand new show, Licensed To Thrill, in Centre Stage on Saturday night - a celebration of the music of James Bond written by the band’s pianist and former MD of London Weekend Television, Trevor Brown. The Orchestra’s Leader, Chris Dean, will also feature on trombone. Europe’s most successful tribute acts - A Vision of Elvis featuring The Memphis Horns – will top off a an evening of high voltage entertainment. Grimethorpe Colliery Band will appear in concert on Sunday night (19th), whilst original and legendary James Shepherd Versatile Brass featuring the legendary James Shepherd himself, will close Sunday evening Gala. To book accommodation, entertainment and parking, visit www.butlins.com or call 0845 070 4751. Day visit tickets are available for Saturday 18 January only. This is due to the limited venue capacity for the entertainment competition on the Sunday. Prices are £21 per adult, £13 per child aged two - 14 and under-twos are free. All competitors not resident on the resort must buy a day visit ticket to gain entry to resort on the Saturday (18th), which are available from 6 January. Butlin’s recommends that Day Tickets are bought in advance by Tuesday 14 January by calling the Butlin’s Day Visits on 01754 762311.